BOOKTRYST: Got The Blues, The Mean Reds, Or The Evil Yellows? 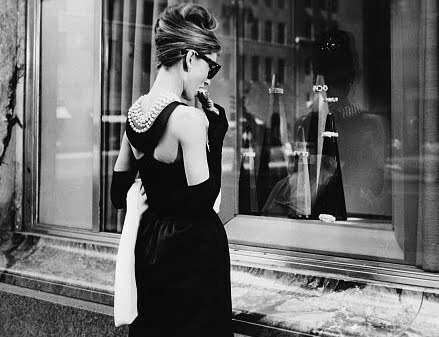 Truman Capote's Breakfast At Tiffany's should be required reading for psychiatrists. Nobody ever painted a more terse and pithy picture of clinical depression than Holly Golightly: "You know those days when you've got the mean reds... the blues are because you're getting fat or maybe it's been raining too long. You're sad, that's all. But the mean reds are horrible. You're afraid and you sweat like hell, but you don't know what you're afraid of. Except something bad is going to happen, only you don't know what it is." The National Library Of Medicine has created an exhibit that adds the third primary color to Capote's mental health palette. It's an investigation of what could be called "the evil yellows." This exhibit, The Literature of Prescription, describes the birth of Charlotte Perkins Gilman's 1892 short story, The Yellow Wallpaper. This literary creation is the world's finest illustration of the old bromide: "the cure is worse than the disease." And the illness was bad enough: a crushing case of post-partum depression. Charlotte Anna Perkins was born on July 3, 1860 in Hartford, Connecticut. She was a poor relation of the illustrious Beecher Family, including Uncle Tom's Cabin author Harriet Beecher Stowe. Soon after her birth, her father Frederick left the family. Charlotte, her mother Mary, and brother Thomas were forced to live on the handouts of various aunts and uncles, shuttling from relative to relative seeking charity. Her mother was an emotionally cold, sickly woman who forbade her children to make friends or read fiction. Predictably, the lonely Charlotte began stealing away to the public library, and reading voraciously. She also showed a natural talent for writing and drawing. 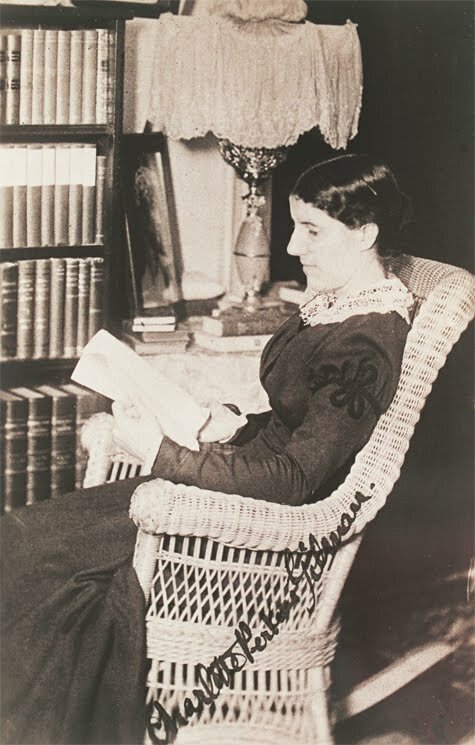 Writer And Reader Charlotte Perkins Gilman. At 18, Charlotte enrolled at the prestigious Rhode Island School of Design. She was a talented commercial artist, and for a time made a living designing trade cards. Here she met her first husband, fellow artist Walter Stetson. They married in 1884, and had their only child, Katharine Beecher Stetson, a year later. Almost immediately after the birth, Charlotte became despondent. She found no joy in motherhood, and felt it did not suit her. She wanted nothing more than to return to her work as an artist. This attitude was considered unwholesome, unladylike, and unacceptable. Walter Stetson wanted a wife, not a business partner. Charlotte's mental frailty became so acute she sought help from the nation's leading specialist in "nervous diseases," Dr. Silas Weir Mitchell. Rest Cure Proponent Dr. Silas Weir Mitchell. Dr. Mitchell specialized in treating women suffering from "nervous exhaustion." 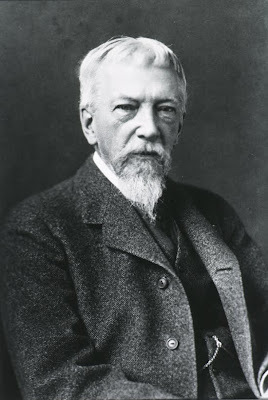 He believed that the cause of an epidemic of neurasthenia among upper class women was an overdose of education. Women who participated in intellectual activities were "exceeding their natural limits." The cure: an intense period of isolation, total bed rest, deliberate overfeeding of fatty foods like butter and cream, and a complete elimination of reading, writing, drawing, conversation, or any other mental activity. Charlotte took the rest cure and got well fast. At least well enough to escape Dr. Mitchell's "care" in a month, with the following prescription: "Live as domestic a life as possible...And never touch pen, brush, or pencil as long as you live." The beaten-down patient tried to follow Weir's advice: "I went home and obeyed those directions for some three months, and came so near the borderline of utter mental ruin that I could see over. Then, using the remnants of intelligence that remained... I cast the noted specialist's advice to the winds and went to work again." 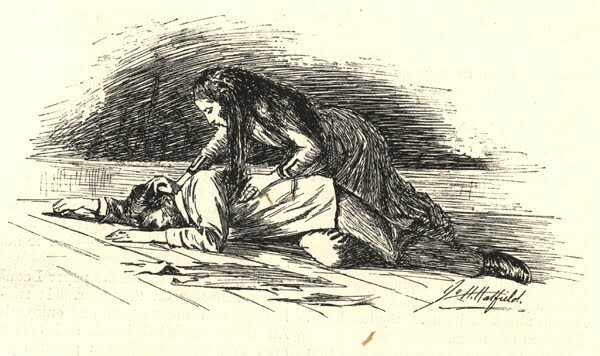 An 1892 Illustration From The Yellow Wallpaper. That work became Charlotte Perkins Gilman's Gothic horror classic: The Yellow Wallpaper. It is the tale of young woman driven mad by the rest cure. The nameless narrator is confined to a locked room with barred windows. In her forced isolation she defies her doctor-husband by secretly writing in a diary. As weeks go by she becomes obsessed with the garish colors and serpentine patterns of the room's wallpaper. She begins to see shapes behind the paper, and eventually becomes convinced there is a woman entrapped beneath it. Hoping to free the imprisoned woman, the narrator begins tearing the paper from the wall. In the end she surrenders completely to her visions, and is last seen compulsively circling the room amidst a sea of tattered paper. Her husband is so shocked by her maniacal behavior that he faints dead away. Despite having the backing of author and literary critic William Dean Howells, The Yellow Wallpaper was rejected outright by the editor of The Atlantic Monthly. Horace E. Scudder's rejection letter read, in its entirety, "Mr. Howells has handed me this story. I could not forgive myself if I made others as miserable as I have made myself." The story was ultimately published in the January 1892 issue of The New England Magazine. Public reaction was swift, and not positive. A letter to the editor called the story "perilous stuff," and the writer found it so morbidly fascinating and sensational that he wondered if such literature might better remain unpublished. Gilman replied that the story "was not intended to drive people crazy but to save people from being driven crazy." The Shocking Finale Of The Story, As Illustrated In 1892. 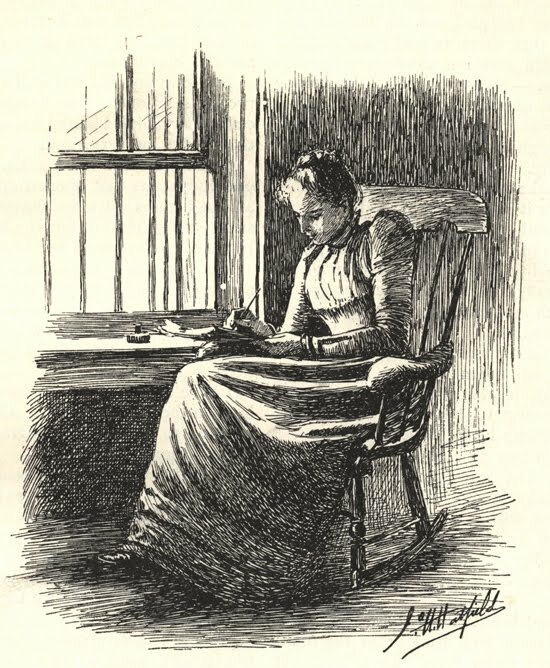 After the story's publication, Charlotte Perkins Gilman divorced her first husband, and in a move shocking for the times, gave him custody of their daughter. She later married a cousin, George Houghton Gilman. The marriage was a happy one, and Charlotte spent the remainder of her life as a writer and crusader for women's rights. She penned both fiction and nonfiction books, as well as essays and poetry, and published her own monthly magazine, The Forerunner, from 1909 through 1916. Most of this work is forgotten today, but The Yellow Wallpaper was rediscovered by feminists in the 1970's, and is now a standard text in Women's Studies classes. Charlotte Perkins Gilman ended her own life in 1935. Her suicide was NOT a result of depression. A firm believer in euthanasia, she chose to inhale chloroform when diagnosed with inoperable breast cancer. Thanks to her harrowing story, the "Three Color Literary Diagnostic Test for Depression" is complete: the blues are manageable, the mean reds borderline, but evil yellows? See your mental health professional, stat! I never read the story, but the 1989 Masterpiece Theater presentation was depressing.